Incubation has begun, although she has not yet finished laying her full clutch (we are assuming that she will lay a fourth egg). 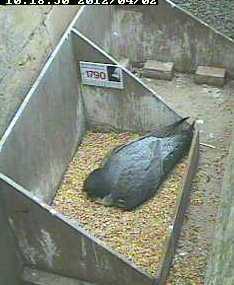 It is usual for Peregrines to begin sitting after laying the penultimate egg. 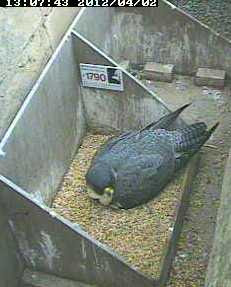 Even the male knows that they should now be incubating, as he took a turn today! Note that he is much smaller than the female.